A fab new addition that will take away the tears. 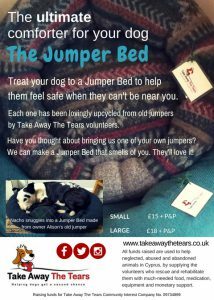 Treat your dog to a Jumper Bed to help them feel safe when they can’t be near you. Each one has been lovingly upcycled from old jumpers by Take Away The Tears volunteers. Have you thought about bringing us one of your own jumpers? We can make a Jumper Bed that smells of you. They’ll love it! Pop over to the Take Away The Tears Shop to place your order.